How do I shot crack in headstock? In my 87 Japanese Precision. Through the E tuning peg to the A peg. Still plays great though. I just got a crack in the headstock of my ES-335 somewhere during the course of my day-long drive. :( (It doesn't still play in my case.) I gather that music stores are used to dealing with this issue in Gibsons. Wow, maybe we noticed at the same time in some kind of synchronicity. A crack running between the holes for the E and the A tuner? It won't affect tuning (the ferrules will stay put), it won't affect sound, and it won't spread or cause structural failure. If you want to fix it, you'll need to remove those two tuners, push out the tuner ferrules/bushings from behind, slightly dilute some Titebond Red or similar, work it into the crack using a piece of paper, and then find a way to clamp the crack shut for 24h without marring the headstock (use blocks of wood between the clamp and the headstock). Then push the ferrules back in and cross your fingers that they don't re-open the crack. Thanks! Yeah, it runs between the E and A peg and then out from the A peg to the edge. Think it has actually been there for a good while, but I had forgotten about and just got fixated because I banged the headstock a little into a music stand. If you say it won't spread or cause any problems then I won't worry. Also noticed that one of the little screws holding in the E tuning peg is missing and another a bit loose. xp if it runs out to the edge, that changes things a bit, because it can then open up and tuners will move etc. You'll need to open it up ever so slightly to get some glue into it - if you have removed the tuners and ferrules you could get a dowel or some other round object that fits the A tuner hole closely, then lever it open a smidge while you run some slightly thinned (10% water) Titebond red into the crack. 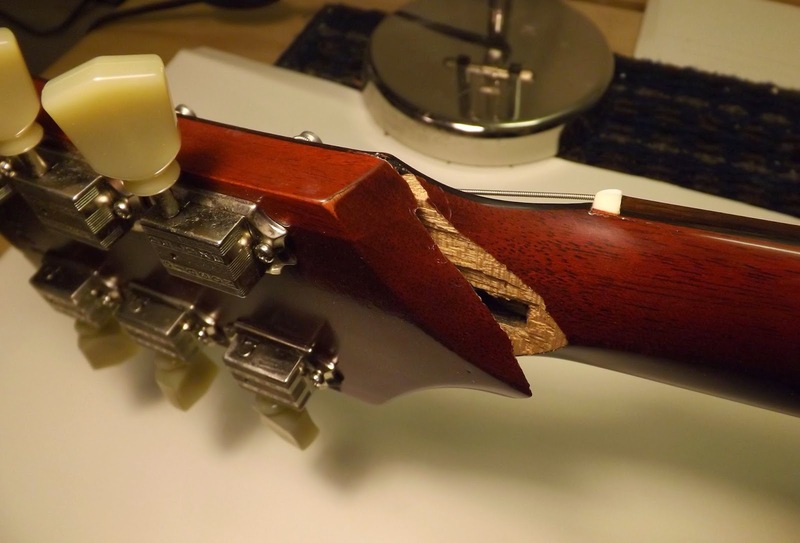 If you take off all 4 tuners you can just run a strip of wood along the top of the headstock and put a cork or plastic or softwood block on the underside, where the logo is, to clamp onto. Use a G clamp or something like that. Setting for 24 hours will make a glued bond which is stronger than the wood itself. Thankfully, my SX Liquid has survived! If you can spread the crack, a tooth pick is good for getting your glue down in the separation. Tooth picks can also be used as filler. They are good to use when say a strap button comes out. You can put in a couple of picks, break them off after putting in some glue then they are soft enough to drive with a drill the screw back in to setup a strap button. Just got it back, paid a real guy to do it. He also did a set up- I wouldn’t let him change the strings though, trying to give Phil Chen a run for his money. He did lower the action though, now I think I have to lighten my touch so as not to generate so much finger noise.